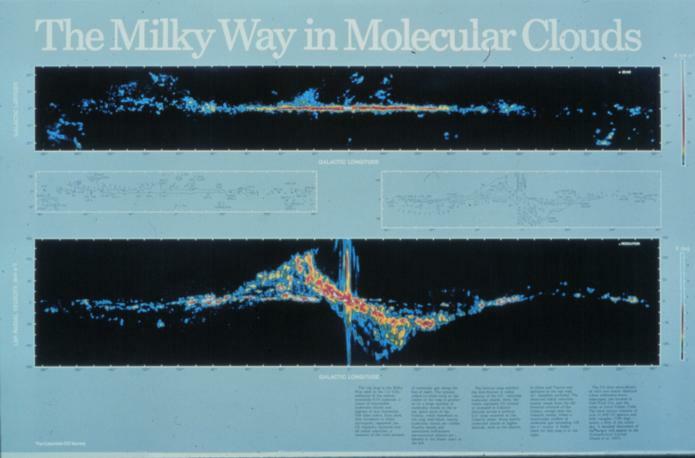 This poster, produced in 1997, is an update of one produced ten years earlier that presented the first complete survey of the Milky Way in CO (Dame et al. (1987) ApJ, 322, 706; Sky & Telescope, 76, 22). Since well before completion of that survey, done at an effective angular resolution of 0°.5, the same two 1.2 meter telescopes in Cambridge, Mass., and on Cerro Tololo, Chile, have been mapping the Galaxy and its nearest neighbors at several times higher angular resolution--every beamwidth (8.7 arcmin) or half beamwidth--and at 5 to 10 times higher sensitivity per solid angle. 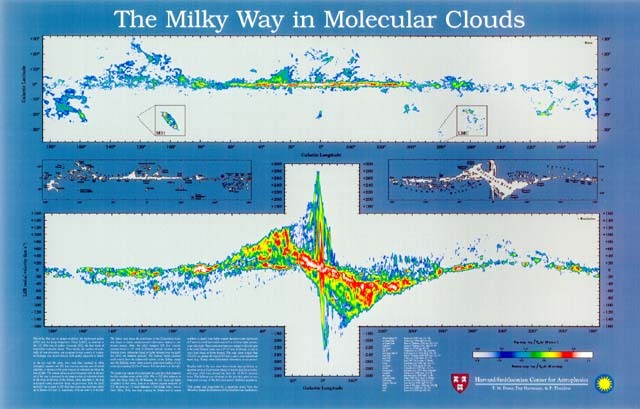 These instruments have now mapped in this way nearly the entire Galactic plane over a 4°-6° strip of latitude, as well as most local clouds at higher latitude. We are proud that our poster hangs not only in many observatories and Astronomy departments, but also in the world-famous Armando's Pizza and Subs, just a block from the CfA. 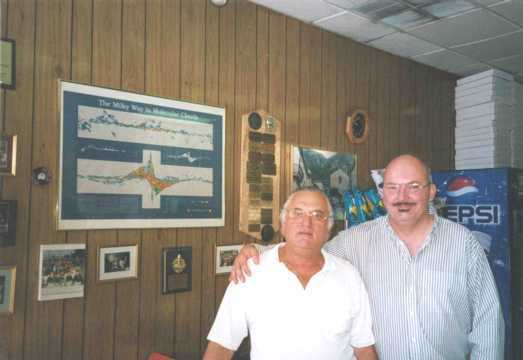 Here's Armando (left) with Dap Hartmann, who persuaded him to take down a picture of his hometown in Italy to hang the poster. The poster rated a mention in a local review of Armando's. A brief Discovery Channel Canada article on the poster unveiling at the Jan 1997 AAS meeting can be found here. The wall posters, measuring 24" x 38", are available to scientists and educators. Email requests to Tom Dame (tdame@cfa.harvard.edu); be sure to include your complete mailing address. Atherton Seidell Endowment of the Smithsonian Institution.